The Heart of Illinois United Way is focused on ensuring individuals and families achieve financial stability. To ensure people can thrive, our work focuses on providing opportunities to get them on their feet again and helping during emergencies and crises. United Way funded financial stability programs provide . . .
Having a stable home provides a sense of security and support for a family and is one of the most basic requirements of wellbeing and financial stability. Through Habitat for Humanity Greater Peoria Area, families have the opportunity to create a stable, long-term home environment and earn the pride of home ownership. By welcoming families to a new home, Habitat provides a sense of security, a place for friends and family to visit, and a base from which parents and children can engage with their community and have access to quality education. Factors for sustained independent living for seniors and adults with disabilities include sufficient income, good health, companionship, and assistance with transportation and meals. Most individuals prefer to remain living independently in their own homes, and with nursing home costs averaging $6,000/month, it also makes sense financially. Those who receive in-home care, home-delivered meals, special transportation, or in-home counseling feel less isolated and more secure, have fewer falls and hospitalizations, experience better mental health, and benefit from more nutritious meals. 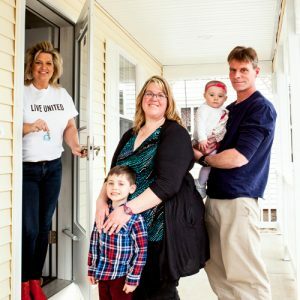 The Heart of Illinois United Way invests more than $300,000 annually in programs that help seniors and adults with disabilities remain independent, including in-home counseling, home-delivered meals, special transportation, and advocacy for abused, neglected or financially exploited clients. If you give $15 a week, you can help a homebound senior combat depression and isolation with counseling and support to remain living independently. If you give $20 a week, you can provide 28 investigations of abuse of seniors and adults with disabilities to determine safety and maintain maximum independence. Beginning in childhood, persons with developmental disabilities are affected by physical or intellectual impairments that impact day-to-day functioning throughout a person?s lifetime resulting in lower incomes, higher unemployment rates, and fewer housing options. The Heart of Illinois United Way invests more than $232,000 annually in programs that provide job training and coaching, integrate individuals into the community, and provide safe housing through group homes and independent living apartments. Dan, a client at EP!C?s Community Job Placement program, has been employed at Anytime Fitness since 2015. Along with the support of his job coach, Russell, Dan helps clean equipment and serves as the fitness center?s mascot outside of the store and at special events. Friendly and loving to interact with customers, Dan is working towards being as independent as possible. The vast majority of 2-1-1 calls received in the past year were requests for assistance with housing and utilities. Many low-income families pay more than 30% of their income for housing and are considered cost-burdened, meaning that they have difficulty affording necessities such as food, clothing, transportation, and medical care. Poverty rates in central Illinois are highest for families with a single female head of household with children, making housing costs a significant barrier to self-sufficiency. The Heart of Illinois United Way invests nearly $440,000 annually in programs that address housing and homeless services. These programs provide emergency shelter, permanent supportive housing and support services to make the transition to stable, affordable housing. Having a stable place to call home is the first building block for self sufficiency, as it is critical for job retention, health/safety, and stability for children. If you give $5 a week, you can provide 2 nights of shelter and 6 meals for a homeless family. Hundreds of people are affected by natural disasters every year in central Illinois. Whether it’ is a fire, a storm or a flood that damages or destroys a home, or power outages that affect daily living, natural disasters disrupt lives. 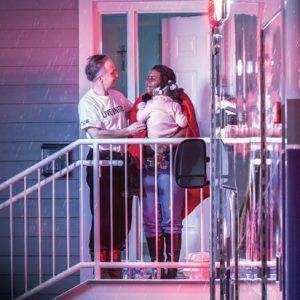 The Heart of Illinois United Way supports the Salvation Army (above), the American Red Cross and the Heart of Illinois 2-1-1 Information and Referral Service that are always ready to help individuals dealing with a natural disaster find food, shelter and emotional support. For a complete list of United Way Funded Financial Stability-Related programs, click here. To see United Way funded financial stability programs at work visit our YouTube channel. Individuals with developmental disabilities are affected by physical or intellectual impairments. These conditions begin in childhood and continue to impact day-to-day functioning throughout the person’s lifetime. Persons with developmental disabilities have lower incomes, higher unemployment rates, and fewer viable housing options. The Heart of Illinois United Way invests nearly $220,000 annually to programs that provide employment, life skills and housing for adults with developmental disabilities. These programs provide employment readiness, job coaching and job retention services, integrate individuals into community settings, provide safe housing options through group homes and independent living apartments, and maximize skills for independence. If you give $5 a week, you can provide 12 hours of employment readiness and job coaching activities to adults with developmental disabilities.